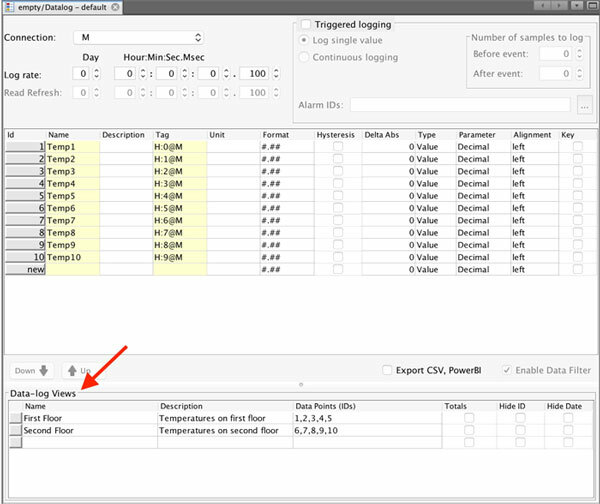 Each data log can have defined multiple tabular views. You can define the data-log views in the same window as you define the data-log. Tabular views enable displaying all captured data from the data-log in the form of a table. List of data points used in this data-log view. For each data point, you can set up configuration parameters in the editor. Shows the totals at the end of the table. Hides the ID (#) column. First, fill in the name and description. Then click the Data Points column and click on the “…” button to include data points in your data-log view. You will be presented with the data points selection dialog.